Few days ago I wrote a post about Thursday Friday, the Stockholm established independent bag company. They created canvas bags with picture of iconic bags printed on the sides, such as the Hermes Birkin, the Chanel Classic Flap, and the Balenciaga Motorcyle. "Thursday Friday loves fashion – as long as it's fun", is the first line that appears on the company's profile page. True to its spirit, their bags are practical, chic, and playful. It's fun! 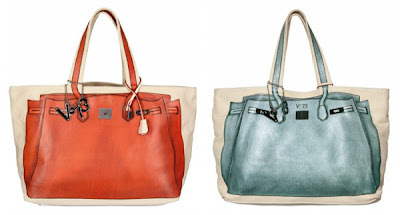 Now there's another brand coming up that offers similar approach to handbag fashion, V73. The company is only newly started in December 2011, but regardless of its fresh entry into the market, it has garnered some reputations among the blogging world. The design slightly differs from Thurday Friday tote. 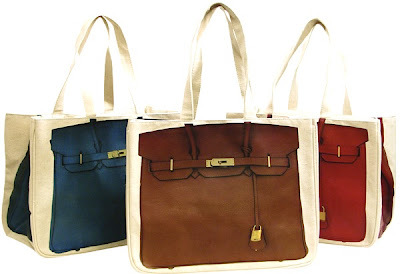 They apply more artistic rendering of the Birkin image rather than a straight-up photo used in the Together tote, and the price is about 3 times higher. The overall concept, however, is still the same. These bags are definitely screaming out loud for Hermes infringement lawsuit, waiting for their branding protection team to file a legal claim like what happened to Thursday Friday. It's a lawsuit waiting to happen.